The Battle of Jemmapes by Baron Marochetti (1805-1867). 1833-34. Marble, on the Paris side of the Arc de Triomphe (facing Avenue Kléber). This important victory during the French Revolutionary Wars was gained on 6 November 1792, and was one of the high points of the army career of Louis Philippe, the future king of the French, whose life was to end in exile in Esher, Surrey, in 1850. Munro Price explains, "in command of the centre of the army, he broke through a strongly held Austrian position and played a decisive part in a victory that opened the whole of Belgium to the French forces" (29). 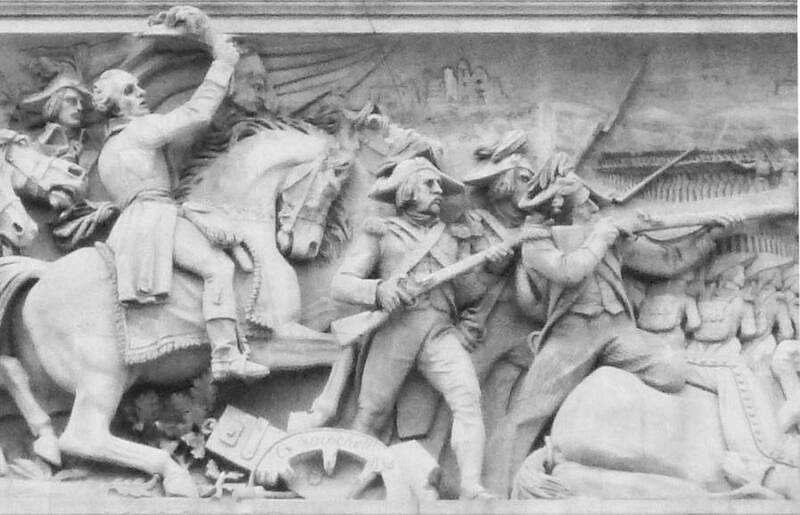 Details from the middle and right of the bas-relief. 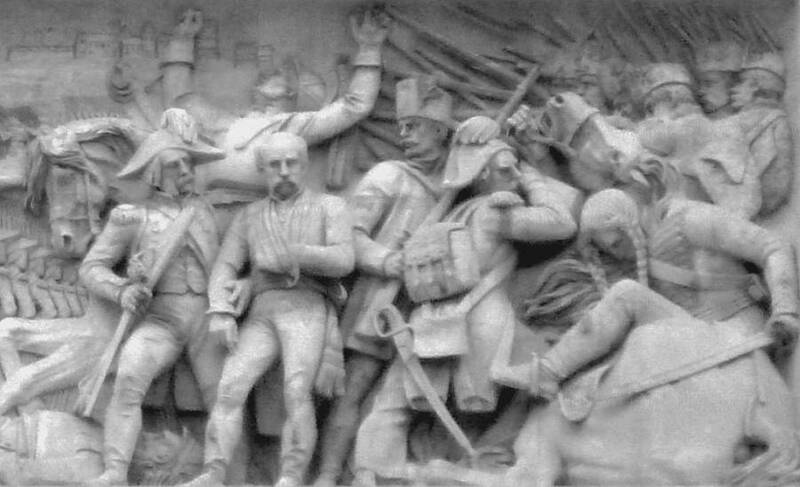 Left: Important French figures shown advancing and attacking in the middle section include General Dumouriez, encouraging his troops, and a very active Louis Philippe himself (known then as the Duke of Chartres) rallying the demoralised centre ("Parmi les généraux qui s'avancent avec Dumouriez, on remarque M. le duc de Chartres, à qui Dumouriez confia le commandement du centre; il rallia les colonnes ébranlées"). Marochetti's name is inscribed on the broken cartwheel at the lower edge of the picture. Right: A senior Austrian officer with his arm in a sling has been taken prisoner, while behind and to his right are scenes of general confusion and distress as the Austrians fall back (see Thierry and Coulon 7). The Arc de Triomphe d'Etoile, to give it its full name, "is almost certainly the biggest triumphal arch in the world" (Ayers 236). Designed by the architect Jean-François-Thérèse Chalgrin (1739-1811), it was erected by order of Napoleon to celebrate the victorious leaders and armies of the Revolution and the First Empire, but not completed until 1836, during the July Monarchy — the constitutional monarchy of Louis-Philippe. Under this regime, which lasted from 1830-48, Marochetti was a natural choice for one of the sculptural commissions. At this stage in his own career, too, nothing could have been more appropriate than a tribute to the monarch who was already his patron, though it is clear that the sculptor's loyalty faltered later on (see Ward-Jackson 182). 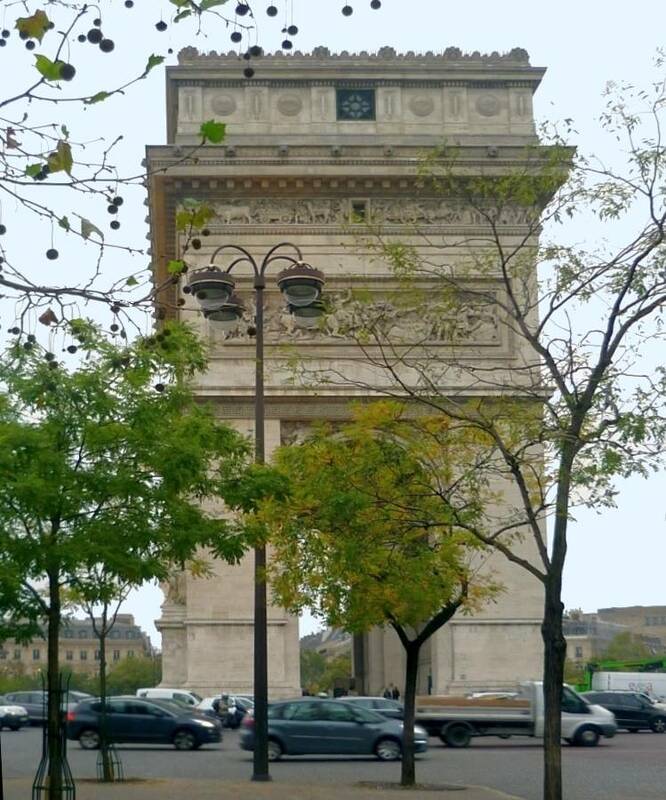 This work on the Arc de Triomphe must rank as one of his most prestigious achievements. Ayers, Andrew. The Architecture of Paris: An Arxchitectural Guide. Stuttgart/London: Edition Alxel Menges, 2004. Print. Price, Munro. The Perilous Crown: France Between Revolutions, 1814-1848. London: Pan Macmillan, 2008. Thierry, Jules D. and G. Coulon. Notice Historique sur l'Arc de Triomphe de l'Etoile. Paris: Thierry, 1840. Internet Archive. Web. 14 October 2012. Ward-Jackson, Philip. "Maintaining Distinction in the International Sculpture Market." In The Lustrous Trade: Material Culture and the History of Sculpture in England and Italy, c.1700-1860. Ed. Cinzia Maria Sicca and Alison Yarrington. Leicester: Leicester University Press, 2000. 174-90.